What child doesn’t love playing cowboys and indians? 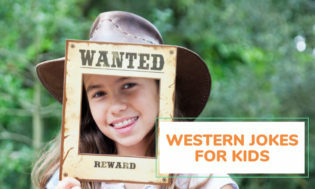 Here you will find some of the best wild west activities for kids as well as some western themed party ideas. Saddle up and let’s get planning. Yee-Haaa! 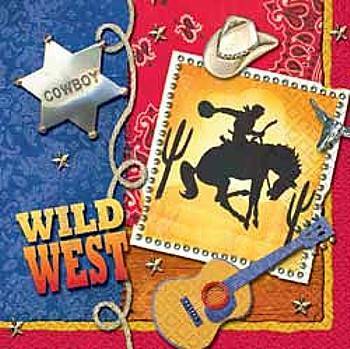 Cowboys, Indians, Ranches, Horses, Cows, Trails, and good old ‘Grub’ is what we think of when planning a ‘Wild West’ Theme! The following ideas are good for a Western, Frontier, or Ranch Theme or Party. 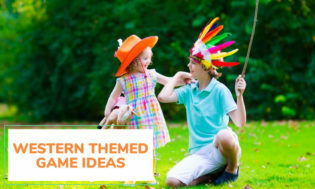 Several of the following activities have been gathered from other areas of KidActivities site….many however…are unique to this theme! Find Art, Crafts, Games, Snacks and more to make your ‘Western Ranch’ theme complete! REMEMBER…when you’rr planning a themed event for a camp, school or child care program, making decorations and crafts BEFORE and FOR the festivities —is part of the fun! Include the kids as much as possilbe. Draw, color, paint a ranch yard scene on paper using crayons or other materials. Glue on the animal crackers to complete your ranch scene. Directions: Have children use pieces of straw for paint brushes. Use different colors and experiment with different looks and methods. Add the pieces of straw to the pictures, when the paintings are complete. This project is great for practicing cutting and gluing skills AND makes a great display. Materials: Chicken Wire, tape, natural raffia, gingham ribbon, old blue jeans etc. 1. Cut squares of small-holed chicken wire. 2. Put masking tape around the sharp edges. 3. Set out assorted lengths of natural raffia, gingham ribbons and narrow strips ripped from old blue jeans. 4. The children weave them in and out of the holes. 1. Take brown paint and paint a child’s hand. 2. Press the hand down on paper–WITH fingers pointing down. 3. The fingers are the legs and the thumb is the head. Trace around hands with black crayon, then turn the paper over so the fingers are pointing down. 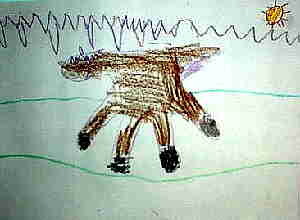 Have children draw details to turn the hands into a horse; add a background. Drawing by a Kindergarten student of Kansas art teacher Michael Austin. To make this craft project you will need animal crackers, a flat backed pin, clear nail polish or varnish, and some craft glue. To begin coat your animal cracker with the polish or varnish in a well ventilated area and let it dry. Next glue it to a pin. The sample made by KidActivities.net was first painted and then covered with many coats of clear nail polish. Draw around child’s body on a very large sheet of paper. From this point you can go three ways. 1. Onto the traced bodies…have children draw on western gear, Cowboy hat, shirt vest, bandanna, jeans, boot, etc. They’ll look cute taped around the room..
2. You could also use the traced body shape and dress it much like a collage. Draw and color on a shirt. 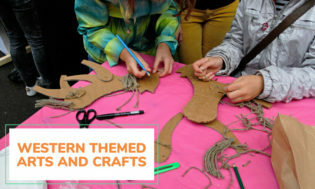 Next–Use brown paper/grocery bags to make and glue on a vest and chaps. Add a bandana made from napkins or paper with a western pattern. Can they make ‘cowboy’ hat shapes? Finish off with boots made from brown or black construction paper. Have children look for and cut out pictures of cowboys, anything from western or frontier days, horses, cows, sheep, open land, mountains, rivers, sunsets, camp fires, marshmallows, franks and/or beans, farm houses, ranches, line dancing, boots, jeans, cowboy hats, barns, rodeos, bandanas, huitar, fiddles (violins), upright piano, cabins, anything Indian, etc. There was a time when ‘frontier mothers’ made yarn dolls for their young children–and older kids made them for themselves! THE BASIC BAND: Cut a 2″ wide strip of paper long enough to go around the head with an overlap of about 1″. Staple ends together. • INDIAN HEAD DRESS #1: Make a basic band; tape or staple feathers to the band. • INDIAN HEADBAND #2: Cut brown construction paper into strips; fit it around child’s head and staple or tape ends together. Cut feathers out of scrap. • INDIAN VEST TO GO WITH HEADBANDS: Cut a vest from a brown paper bag, cut a slit up the front and neck and arm holes. To decorate, either cut out construction paper shape (arrows, sun, designs, etc.) and glue them on. Punch a hole each side of where the bowl is stapled. Put a long string, ribbon or sturdy yarn through the holes– tie loosely under the chin. Be sure to put together so no choking is possible. CACTUS ART… Just let the kids create!!! Create an open art table by putting out construction paper, water color paints, torn tissue paper and tooth picks or straight, uncooked pasta pieces. The image on the right is a construction paper cactus, with broken pasta pieces (the spines) and red tissue flowers. All are placed on a water color background. 1. Dip short lengths of clothing line into a bowl of glue. 2. On card stock, loop and place the rope onto the paper, trying to shape it into a lasso. •Cut the paper towel roll into six sections of similar width. •Paint the sections- decorating with glitter glu, and other details as desired. •Once the paint is dry, apply googly eyes and glue a red felt forked tongue to the ‘head’ tube section. Simply purchase some western themed temporary tatoos. Following package direction –‘brand’ the children–make a sizzle sound while applying the water onto the paper when it is on the skln! Cut sponges into horseshoe shapes. Place ‘horsehoes’ in shallow containers with small amounts of tempera paint. Stamp onto large pieces of paper. The finished art can be used as wrapping paper or interesting works of art! 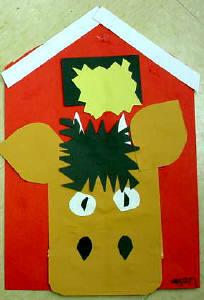 → Using plush animals and puppets–Decorate with ranch/frontier/western animals such as horses, cows, pigs, chickens, etc. → Can you find a saddle and/or other cowboy themed gear? In case you haven’t played in awhile– Horseshoes is an outdoor game played between two people (or two teams of two people) using four horseshoes and two throwing targets (stakes) set in a sand area. Each side takes turns tossing their ‘shoes’ to the other side at the stakes in the ground. The closest one to the taget wins. The aim is to get a ‘Ringer’ which means to wrap the Horseshoe around the post when it is thrown. (It is traditional to place stakes 30-40 feet apart; however, when playing with younger children, place the posts closer to each other.) The game pieces are traditionally metal–however rubber sets are sold for younger children. 1 point is given for each horseshoe that is closer to the stake than the opponent’s horseshoe. 16. Play “TRADTIONAL GAMES” with a Western Twist! 2. Instead of Old McDonald Had a Farm…Sing “OLD MCDONALD HAD A RANCH”, complete with very loud sound effects. Each child or section can be given a different animal to act out. •All the children line up side by side except the player who is the caller. • The caller stands at a distance from the lined up players. • The Cowboy answers “Yes, you may.” The player takes the prescribed number of steps toward the caller. If the player forgets to ask permission after they get directions— and takes steps toward the caller— they are sent back to the starting line. • The first player to reach the caller is the winner and new caller. OR other versions such as: Pin the Tail on the Cow, Pin the Tail on the Horse, Put the Hat on the Cowboy or Rancher, etc. While young children think “Duck, Duck, Goose” is fun—those over grade 2 may take offense with playing a “Baby” Game…that’s when you try the game with a “Themed” title. When “It” touches a player and says “Horse”, that person must chase “It” around the circle. 6. Instead of “Drop the Clothespin in the Bottle”–play DROP THE SNAKE IN THE BOOT or COWBOY HAT! •Place a cowboy boot or cowboy hat on the ground. •If children are young, have them stand over the boot/hat and drop the snake in the boot. In the original clothes pin version of the game–the child would kneel on a chair. He/she would face the back of the chair. A large-mouthed bottle would be directly below the back of the chair–where the children would drop the clothespin straight down. The child with the most clothes pins in the bottle won. • Have older children stand farther back and attempt to toss it into the boot or hat. 1. Depending how many children you have–form teams. You can have anywhere from 3 Teams to ????? 2. Teams are in their groups and one end of the gym. 4. Two or three persons are “It” in the middle of the room. 6. All sheep must run to the pen at the opposite end of the room without being caught. 7. When “BARNYARD” is called, everyone must run to the opposite end. Before the game, inflate two white balloons. Attach short pieces of black curling ribbon to make sheep tails (or longer for cattle tails) and use a black marker to draw faces on them. To play, divide players into two teams. Give the first player on each team a broom, or fly swatter,to herd their team’s sheep across the room and back to the next player in line. The first team to finish herding their sheep wins! Place a hay bale inside a plastic swimming pool and pull it apart. 20. LASSO THE COWBOY BOOTS! This game can be played individually or in teams. If playing in teams–assign ‘theme related names’ such as Ranchers and Herders, Cowboys and Indians, Sheriffs and Cowboys, etc. 2.Using smaller sized hula hoops, try to throw the hoops and ‘ring’ the boots. The individual or team who get the most hoops on the boots wins. If you have several pairs of cowboy’s boots, you can play the opposite way. Instead of throwing the rings around the boots—THROW THE BOOTS INTO THE RINGS! Don’t forget about SQUARE DANCING, LINE DANCING, OR THE TWO STEP! Do you know or can you hire a caller? 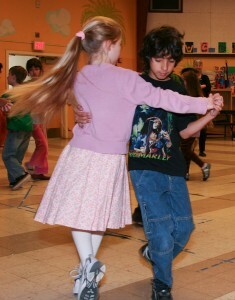 Yes, if handled right–kids WILL dance. Check out this You Tube video of ‘very young children’ dancing! You don’t have to be perfect to have fun! On the signal, advance to the turning point where they change positions and return to the starting line. Each player steps into his/her sack with both feet. Pull the sack high enough to hold the edges. Practice hopping first, until all of the players get the hang of it. Identify the start and finish lines. Blow the whistle and go! 1. Put the variety of ingredients out in bowls. TIP: Let children know how much ‘measurement-wise’ they can take of offered foods; also how many choices they can have. Example: Eash child can take 1/2 cup of 4 food choices offered. Mix pretzels, Corn Pops, Rice Chex, etc. In separate bowls put out M&M’s, nuts, raisins, coconut, cereal, candy sprinkles, chopped apples and bananas! Have children add and mix in what they like! Enjoy! 33. MAKE HOMEMADE BUTTER just like the pioneers! 1. Put 2 tablespoons whipping cream in each baby food jar. 2. Put lid on tightly and shake as long as can. 3. Remove lid and pour off excess liquid. 4. Spoon butter into the smaller bowl and set this bowl in the bowl of ice. 5. As butter chills, continue to press it again the side of the bowl to get rid of any remaining liquid. 6. When ready…enjoy on some good bread or rolls! Optional: May add 1 cup chopped walnuts or peanuts. Melt chips; mix in noodles until coated well. By teaspoon onto was paper. Put in refrigerator to set. 35. COW CHOW…Make the always popular ‘Puppy Chow’ but call it Cow Chow! 3. In a paper bag or very large bowl… put 2 1/2 cups confectioner sugar. Note: The mixture actually tastes better after a day or two. The cereal absorbs the chocolate mixture! Yummy! Melt chips and peanut butter in microwave. Blend together. Stir in peanuts and noodles gently in the peanut butter mixture. This is a great variation to the rice cereal treat recipe. Using traditional ‘Rice Krispies recipe’…replace the rice cereal with corn flake cereal. Follow the instructions combining the cereal, melted marshmallow and butter mixture. Mold the cereal mixture into the shape of haystacks. 38. DON’T FORGET TO MAKE S’MORES! Place 2 tablespoons of syrup in bottom of large glass. Add root beer, stirring until liquid is within 2 inches of top of glass. Add a huge scoop of ice cream. 1. Pour cold lemon lime soda into a punch bowl. Add lime sherbet. 2. Make green Kool-Aid and add lemon lime soda. Lime sherbet could also be added to this. SERVING FOOD…IT’S ALL ABOUT PRESENTATION! → Make a sign saying “SALOON’ for the area where drinks are served. → Hang a sign that says ‘CHUCK WAGON or GRUB’ over the buffet table/serving area. → Use Bandanas for place mats or napkins. → Use red check tablecloths or bandana print table cloths. Red and white roll paper (butcher paper) would also work. → Mason jars would make nice vases for field or wild flowers. An old cowboy boot fitted with an interior vase would also be great holding wild flowers! → Do you have an ‘old’ toy train set? If so –place it on the table with an appropriate center piece or cake in the center. On small burlap bags write the word “Feed” with a black sharpie pen. Fill the bags with any snack mix. Tie the top with twine. Line the hats with napkins and a bandana or two. Fill with snack type food such as chips, candy, snack mix, pretzels, etc. Serve food in PIE TINS…or aluminum or tin PAILS/BUCKETS of various sizes. Use tin pie tins as plates! Serve root beer, lemonade or sweet tea in MASON JARS and/or beer mugs. Welcome all Cowboys and Cowgirls (or Buckaroos or Cowpokes) Place sign at main entrance. No Bandits or Outlaws Allowed in this Town! How about…No Spittin, Drinken or Chewin allowed on the premises! Purchase cut-out shapes/decorations of Cactus, Cowboys/Cowgirls, Horses, etc. These can be purchased at any local party store or on line at places such as Oriental Trading, Shindigz, Birthday Express, etc. Although they are expensive, large cut-outs of “old west buildings” are also available from many on-line party sources! 44. MAKE A JAIL or SHERIFF’S OFFICE! A great photo op and decoration in one! 1. Using a large refrigerator box carton–paint the outside a stone color or brick design. 2. Carefully cut out a large square or rectangle shape window. Either cut the window leaving cardboard ‘bars’ or later add the bars by taping on ‘jail bars’. The ‘jail’ can be made where the children can enter and look through the bars…or flat where it leans against a wall as a decoration. Idea: if you are making the ‘jail’ as a flat decoration, consider making other building exteriors such as saloon, bank, general store, etc. You may be able to find large boxes at nearby furniture or appliance stores. 45. HAVE A WHEEL BARROW? Fill it with soft toy ranch/farm animals. YEE HAW…Welcome party or theme participants with a fun entrance! Stick a “Welcome Buckaroos” or “Cowpokes” sign into a bale of hay. If the event is being held outdoors, place other bales around for atmosphere. For outdoor parties, bales of hay also make great seating…either around the eating table or here and there! Logs/wood placed in strategic spots can also make a dramatic statement. Horshoes, Old wagon-wheels, bandanas, lanterns, oil lamps, cowboy boots, a saddle, ropes, Wanted Posters, balloons, and streamers also add to the western festivities! Either purchase ballons already colored in black and white cow patches/spots– or paint black patches onto white balloons. Balloon Ideas: Tie onto each guests chair; group around the party area; place at front entrance with bale of hay; use on tables as centerpieces or on the ‘grub’ table; hang a very large bunch from the ceiling over a main table or center of the room. It will not be filled with hellium, so if grouped together tightly, will resemble a chandelier. Besides sharing the following jokes, what can you do with them? Use this JOKE AND PUNCH LINE Activity… Great for connecting and for an ice-breaker! Write a joke on one card and a punch line on another. Be sure to mix the cards up. The number of different jokes depends on the size of the group. Give each person a card. Explain that they may have a joke or a punch line on the card. On a given signal, they are to walk around the group trying to find the other part of their joke/punch line. When this is done, everyone can return to a circle and with their partner, tell their joke. Why did the rancher buy a brown cow? What runs around a ranch but doesn’t move? 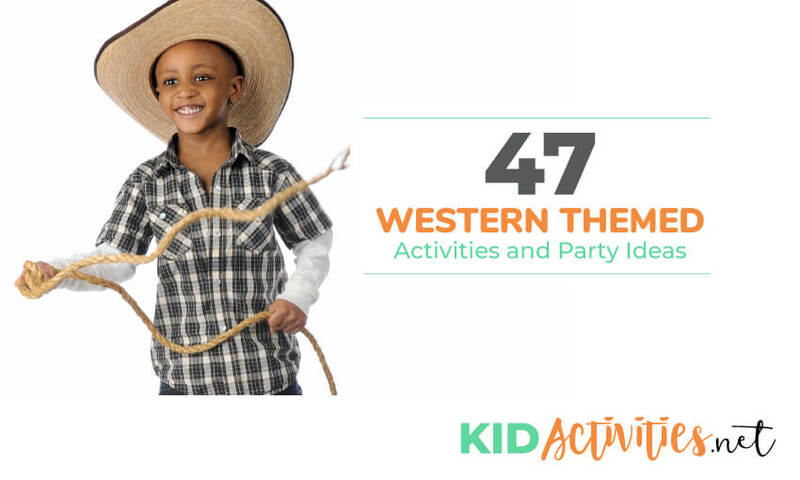 There you have it, some wild west themed activities for kids and some western party ideas. We hope you have enjoyed these ideas and hope they inspire you to have a fun wild west event. Make sure you check out our circus themed activities as well.